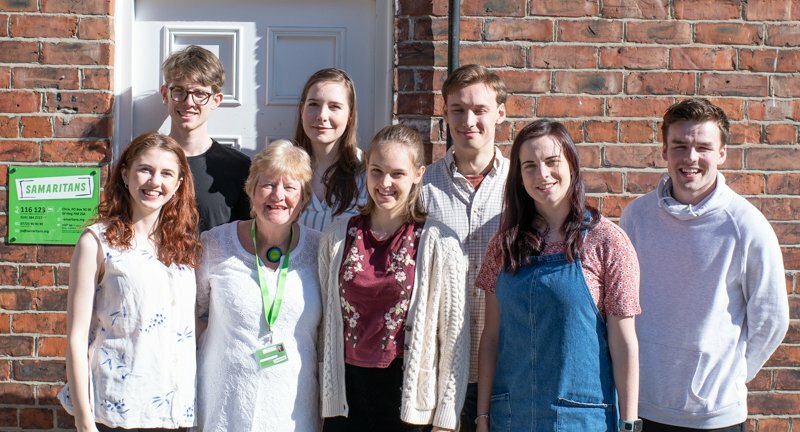 My name is Rosemary and I am the Director of Durham Samaritans. Our branch is situated in Durham City and we are a short walk from Durham railway station and Durham bus station. We have been providing support to telephone callers and visitors for over 49 years and also offer email and text support for those who find it easier to communicate this way. Our service is needed as much today as it was back in 1970 and every year, we take around 25,000 calls from people going through difficult times. We work closely with Durham University, providing training and support to Nightline, a student-run listening service for students. Our volunteers provide training to prison listeners in Durham and Low Newton prisons, and we give outreach talks to local schools and community groups. We also have a presence at important local events such as the Durham Miners’ Gala, Durham Pride and the Great North Run. We are always looking for new volunteers for both listening and support roles, so whatever skills you have to offer, please do get in touch. We run Information Sessions and Selection events where you will receive a very warm welcome and the opportunity to learn more about the work we do. Alternatively you can complete the short application form on this website to express your interest in volunteering with us. It doesn't commit you to anything, but tells us that you'd like to find out more about what we do. Durham Samaritans, a charity registered in England (1173976). Durham Samaritans is a recognised branch of Samaritans.